Are you considering orthodontic treatment for you or your child??? 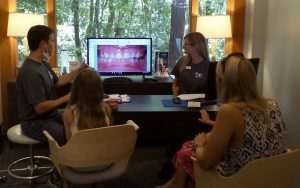 After arriving at Reagin Orthodontics, our talented team will welcome you and immediately have you tour the office. We want you to be familiar with every nook and cranny that you will be calling your orthodontic home for the next few months. Marie, our treatment coordinator will meet with you to take initial records. This basically means x-rays and photos. So smile big for the camera! After the records are taken, Dr. Reagin will perform a full oral exam and identify any orthodontic concerns. Marie and Dr. Reagin will discuss the appliances with you and the schedule of treatment. Some of our most common appliances include: Invisalign, metal braces, elastics (rubber bands), Herbst appliance, separators, expander, positioner, retainers, separators, and the twin block appliance. Finally, we discuss your investment in a confident smile! What size investment it will take to have your smile as bright as you are so you can smile with confidence. We offer flexible payment options so that everyone can enjoy a beautiful, confident smile.